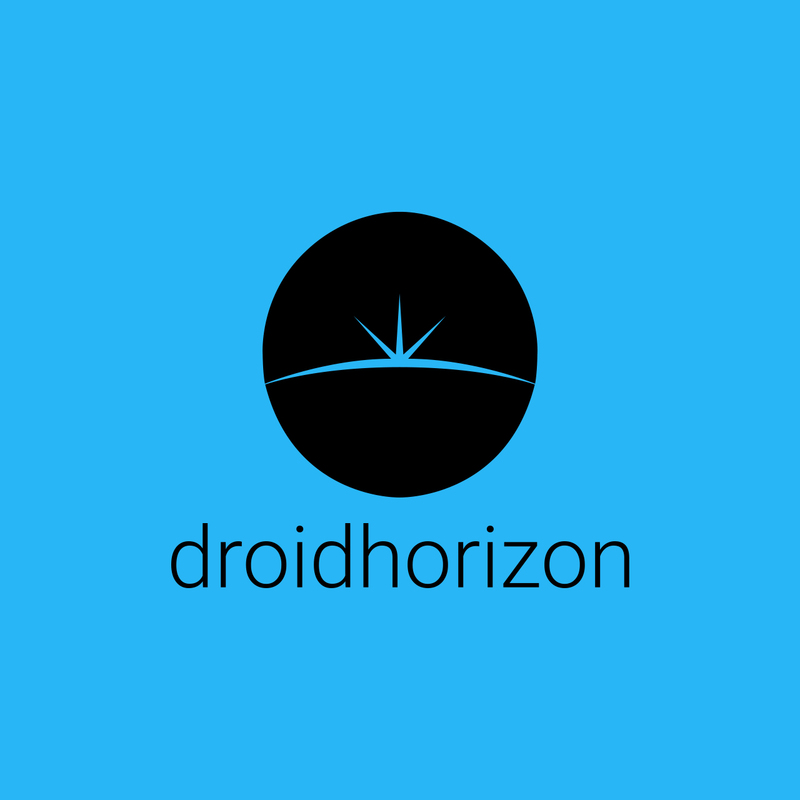 For me 2015 has been the year we’ve really seen a major leap forward in Android smartphone cameras. The performance of many high-end handset shooters is finally good enough that most people won’t feel the need to carry a separate camera. Have said that, the smartphone experience still lacks some of the finesse of a dedicated camera. Tripod use is out the window and one-handed point-and-shoot can be tricky – especially with larger phones. 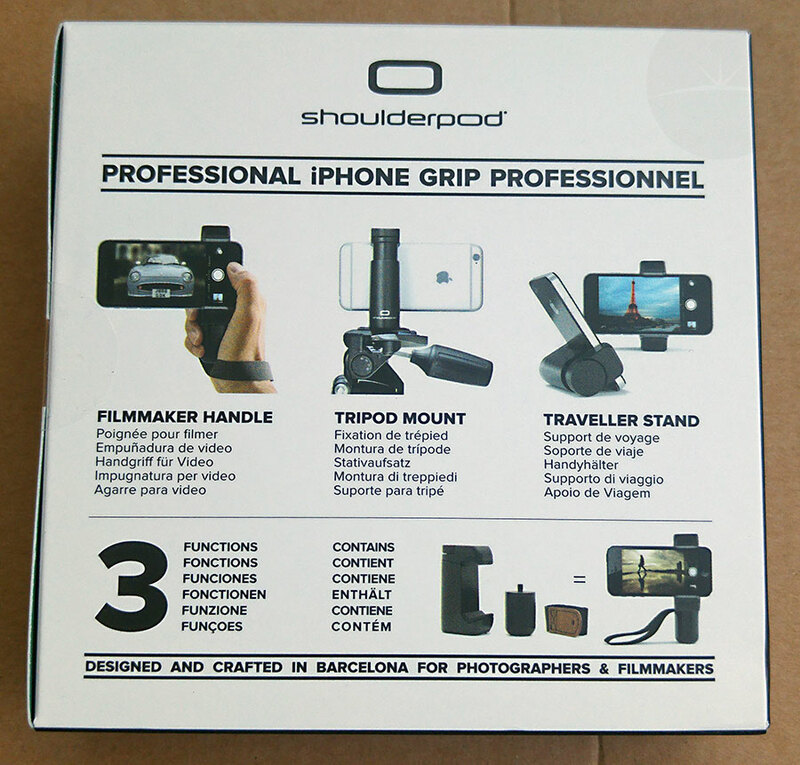 Luckily Spanish company Shoulderpod have come up with the S1 – a smartphone grip with three functions – it that can be used as a tripod mount, “filmmaker handle” or “traveller stand”. 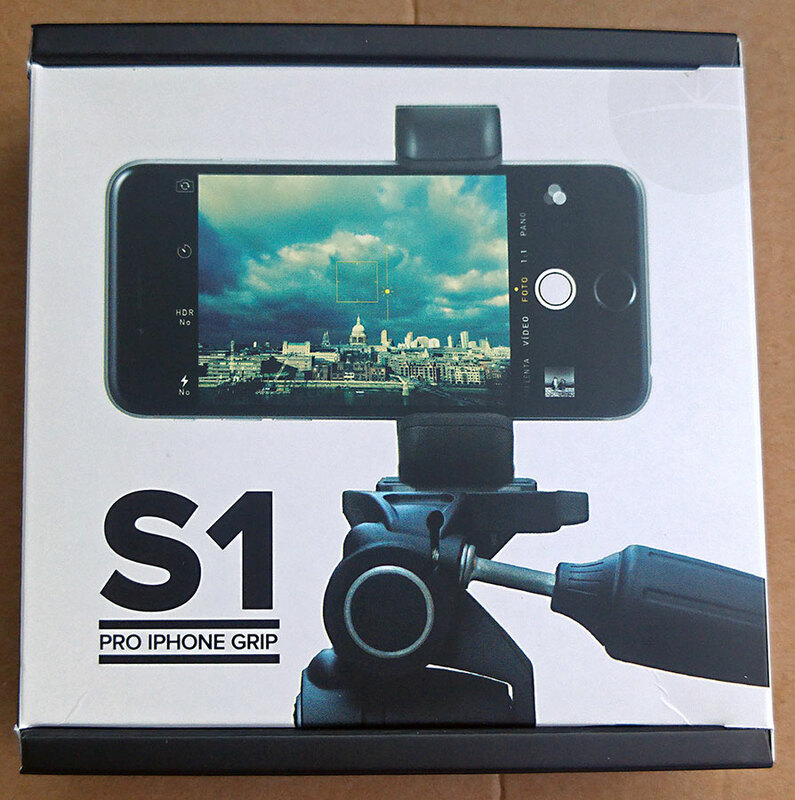 The S1 comes packaged in a cardboard box with lots of iPhone pictures, while describing it as a “Pro iPhone Grip” – even though it can hold just about any smartphone between 48mm and 93mm. I won’t hold this against them, but it does baffle me why their marketing department would want to alienate a significant percentage of their potential customer base like this. 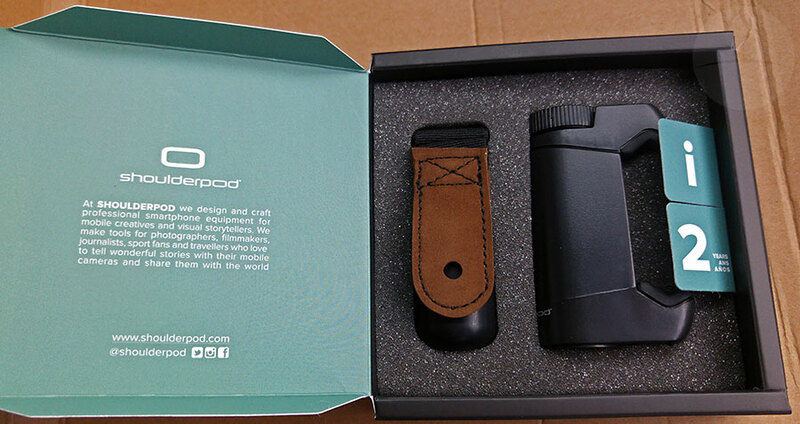 Anyhow, inside you find the grip itself, the handle and a genuine suede wrist strap. 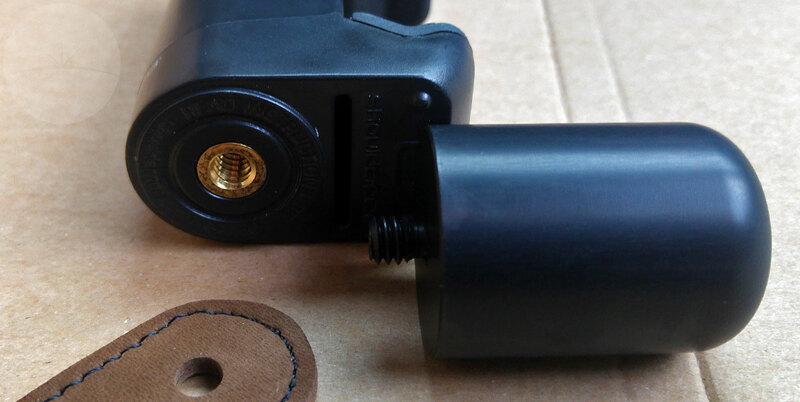 The handle has a ¼” tripod screw which can be threaded through a hole in the wrist strap and screwed into the grip. Everything is top quality with aerospace grade aluminium, anodized with a matte black finish. The grip has a screw-wheel on top which extends or retracts it’s rubber arms, clamping down on your phone with a vice-like grip. This can be positioned anywhere along your smartphone and holds it very firmly (even with a case) – I had no concerns that the phone would slip out during use. Used in this way (without the handle or strap), the S1 can attach to any standard tripod with a ¼” screw, steadying it for long-exposure or video photography. It can also be used to prop up your phone on a flat surface – vertically at an angle or straight up horizontally at 90°. Apart from the build materials, what really sets the S1 apart from one of the many $10 plastic smartphone tripod mounts available, is the ability to attach its handle. If you position the grip to one side of the phone (under the on-screen camera button) you can hold the handle with your fingers and easily trigger the camera button with your thumb. It’s difficult to put into words just how much better this feels compared to holding your phone between your finger and thumb while tapping the camera button – especially one-handed. 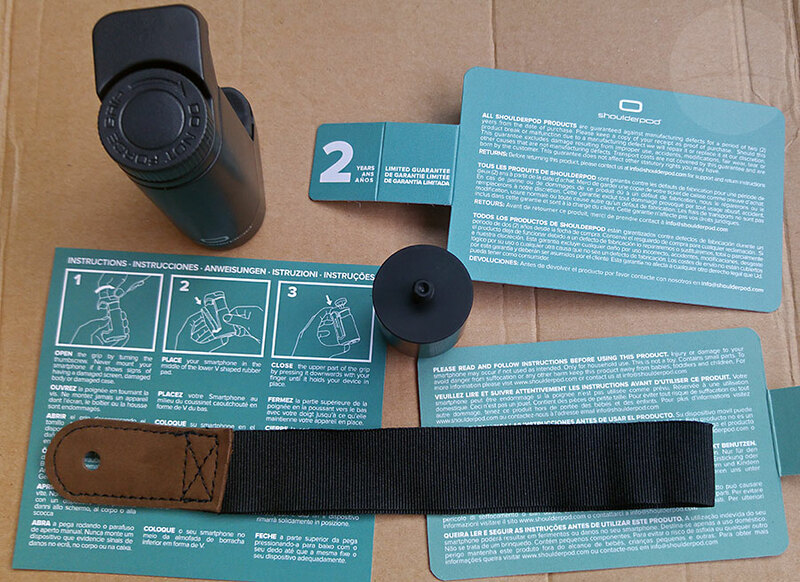 It gives you a very secure, stable and comfortable grip – plus you can have the wrist-strap as backup in case it does get knocked out of your hand. For me the restrictive angles and hassle of clamping on the S1 wouldn’t make it a compelling phone stand. However as a smartphone photography tool it is quite simply fantastic. While the build quality and looks already set it apart from cheaper tripod adapters, it’s the innovative handle design that really elevates the phone camera experience to something rivaling a dedicated compact camera. Personally I won’t be clamping this grip on for every random snap I take, but it’ll definitely be in play whenever I go sightseeing. Also the strong build materials and universal design means I can keep using it with future phones after I upgrade. If you’re in any way serious about smartphone photography then the Shoulderpod S1 is well worth the $35 asking price and comes very highly recommended. My bad – turns out the packaging on the sample I received was non-standard, intended for Apple stores.